Back in 2010, the Pew Forum on Religion & Public Life conducted a survey that concluded, “More than four-in-ten Catholics in the United States (45%) do not know that their church teaches that the bread and wine used in Communion do not merely symbolize but actually become the body and blood of Christ.” At the time, I cautioned about interpreting the meaning of these results by noting that knowledge may not always represent belief (...also pointing out that even 59% of Protestants state a belief in Transubstantiation). I argued that, "Strangely enough, many Catholics believe what their Church teaches without realizing that their Church teaches it." Some commenting online scoffed at the idea that this could actually be the case. At the time the data did not exist to test this notion. 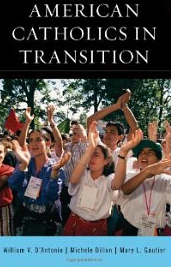 Now it does in the newly released landmark study American Catholics in Transition by William V. D'Antonio, Michele Dillon, and Mary L. Gautier (i.e., the famous senior research associate at CARA). This is the 5th book in this series of research that began in 1987. In comparison to the Pew study, D'Antonio et al. find that half of self-identified adult Catholics (50%) are unaware that the Catholic Church teaches the following about the bread and wine used for Communion: "the bread and wine really become the body and blood of Jesus Christ." However, 63% of adult Catholics, regardless of what they think the Church teaches, believe that "at the Consecration during a Catholic Mass, the bread and wine really become the body and blood of Jesus Christ." As shown below, this creates four groups. 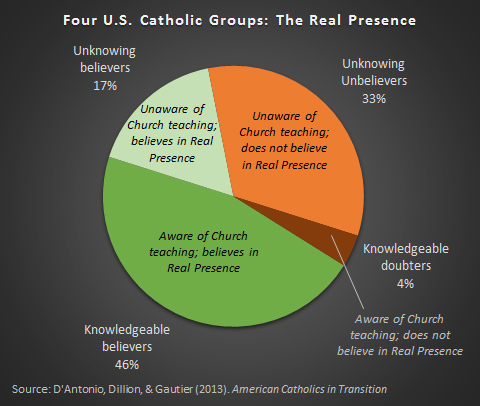 The largest are "knowledgeable believers," representing 46% of adult Catholics, who are aware of the Church's teachings about the Real Presence and say they believe these to be true. Additionally, there is another 17% who believe in the Real Presence but who are unaware that this represents a Church teaching. These are the "unknowing believers." The second largest group is the "unknowing unbelievers" who do not believe in the Real Presence (i.e., they believe the bread and wine are only symbols) and do not know that this represents a teaching of the Church. There is something hopeful about this group, which represents a third of adult Catholics (33%). Even though they currently do not believe the Church's teaching, they may come to believe it if they knew and understood it better. Knowledge and belief of this may even bring more of them to a Catholic parish on Sundays. What is rare, representing only 4% of adult Catholics, is someone who knows about the Church's teachings regarding the Real Presence and who states they do not believe this teaching to be true. These are the "knowledgeable doubters" (...note that this study uses the same methods of CARA Catholic Polls, e.g., anonymity, self-administered response without an interviewer, which limit social desirability bias). What I have noted above is just one tidbit from American Catholics in Transition, which is an extraordinary piece of research. There are often many anecdotes (or survey results based on small Catholic samples) thrown around about what is going on among Catholics from parish life to politics. This book provides some data that confirms and denies many of these anecdotes. It spends a good deal of time disentangling generational and gender differences. The latter providing some of the biggest surprises and concerns. I am thankful to the authors for taking the time to test one of my ideas (...it helps when a co-author sits a few steps away!). I think there is some reassurance in their conclusion about the data above: "Among all Catholics who know what the Church teaches about the Real Presence, fewer than 1 in 10 (9 percent) say that they do not believe the doctrine." Now we know that lack of belief in the Real Presence is more a problem of religious education than of doubt. Photo above courtesy of stlyouth from Flickr Commons. Who Speaks More "Catholic" in Congress? Who talks the most about "Catholic" things in Congress? 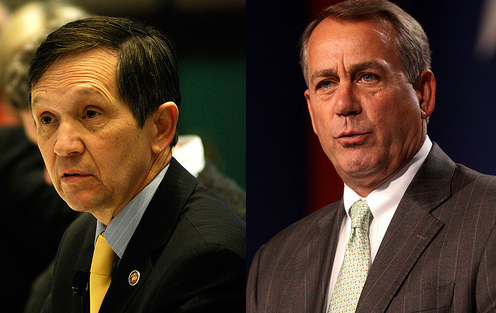 According to Capitol Words, since 1996, no one has mentioned that word more often "on the record" than Rep. Dennis Kucinich, Democrat from Ohio (in the House of Representatives since 1997, Kucinich's final term ended in January and is now a analyst for Fox News). Other Democrats using the word often in the Congressional Record include Rep. Daniel Lipinski (D-IL), Rep. Marcy Kaptur (D-OH), and House Minority Leader Nancy Pelosi (D-CA). 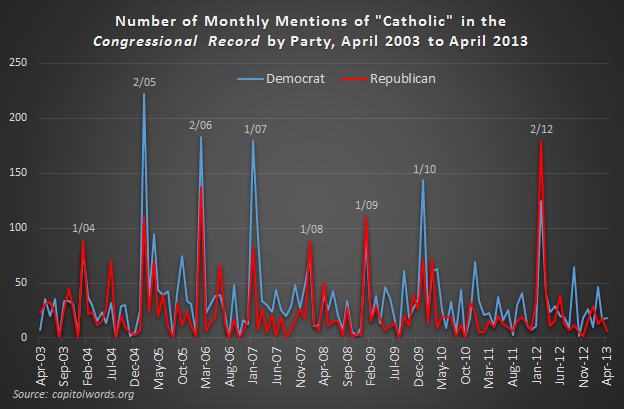 Since April 2003, Democrats have averaged 34 references to something "Catholic" per month in Congress. In 84 of the 121 months (69%) that have passed since Democrats have mentioned "Catholic" more often than Republicans. On average, Republicans have mentioned something Catholic 23 times per month. In all, Democrats have said "Catholic" in the Congressional Record 4,110 times since April 2003 and Republicans have said this 2,800 times. Since 1996, the Republicans using the term most often are Rep. Christopher Smith (R-NJ) and Speaker of the House John Boehner (R-OH). As shown in the figure below, something Catholic is most likely to come up in either party in the months of January or February. One can search the Congressional Record and see that these references are often honoring a Catholic individual, parish, school, or charity (...one could also use this to explore the content and context of the speech using the word "Catholic" that could reveal much more. Obviously frequent use of the word is no proxy for what the Catholic faith actually stands for. Usage of the word could be positive, neutral, or negative toward the faith). It is the case that generally there have been more Catholic Democrats in Congress than Catholic Republicans in recent history (including the current session). Generally, members of Congress who self-identify as Catholic are more likely than those who do not to use this word in the Congressional Record. However, there are a few who self-identify with other faiths who have used the word often including Republican Frank Wolf (R-VA) and Democrat Sheila Jackson-Lee (D-TX). The figure above shows the actual number of times "Catholic" appears in the Record. Capitol Words has a nifty interactive tool that allows one to see mentions of any word or phrase as a percentage of all words in the Record for a given month (...it works similar to Google's Ngram Viewer, which allows for searching of words or phrases in books by language since 1800). This site is a project of the Sunlight Foundation which seeks to provide more transparency to American government. In addition to looking at the usage of a single word one can compare the frequency of use of words or phrases. For example: God vs. secular, pro-life vs. pro-choice, or poor vs. middle class. This site is one of many I've seen released and/or used by others recently that utilize somewhat unconventional data in an accessible format. Also among these is the hedonmeter which uses Twitter to measure general happiness. Nate Silver's interactive graphic on demographics and presidential elections is fascinating and also deserves a look. I'm also a fan of this interactive graphic that allows one to geographically visualize America's housing market in the context of when homes were built. In the past I have written about using Google Trends as a measure of general interest in things "Catholic" (Google Correlate also adds some important context). At the time some expressed doubts about the results. Since then this tool has been used to predict flu outbreaks and the stock market. I'm more sure than ever that it is measuring something important (and for now worrisome). Now even Facebook likes are being used to predict personal information and demographics (...can these be used to predict "Catholicity"?). Here at CARA we will continue to explore the world of "big data" and non-traditional data more generally (i.e., other than standard historical and demographic statistics, surveys, focus groups, or experiments) to see what it can reveal about the faith. It turns out you can even learn a bit about CARA by searching for it in the Congressional Record. Update 5/7: I looked to see if I could do something similar with presidential mentions of the word "Catholic." I found some data in the archives of the The American Presidency Project. 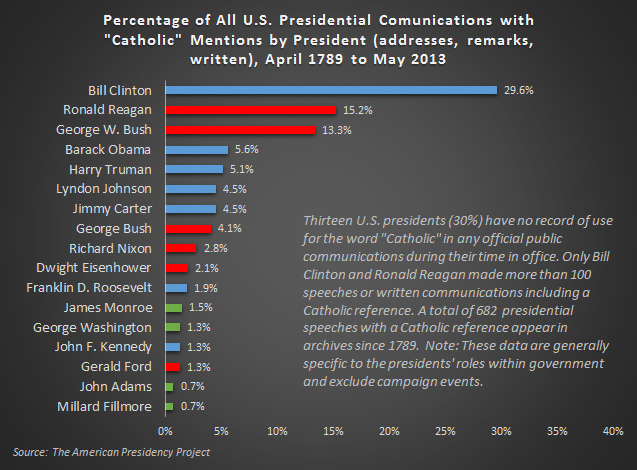 The results of this analysis are shown in the figure below with Bill Clinton and Ronald Reagan racking up the most speeches or written documents including a "Catholic" reference (...as a percentage of all communications made by any president in available addresses, memos, news conferences, etc.). Note the searches generally exclude references while campaigning (the archives are less complete for this material historically) and obviously many new forms of presidential communication exist now than in the 18th and 19th centuries (...we've touched on the link between technological changes and the content of Inaugural Addresses in a previous post). Photos above courtesy of SEIU International and Gage Skidmore from Flickr Commons. When kids enter their teen years they often become more peer-connected than parent-connected. They may talk to their parents less and their social life often begins to be centered more on friends rather than family. For the parent this may add a new and uncomfortable air of mystery surrounding their children’s lives that they have never experienced before. Survey researchers often find teenagers just as mysterious as we rarely have the opportunity to interview people under the age of 18. This is unfortunate as much of the “churning” of religious identity and behavior begins in the teen years. As a recent study by the Pew Forum on Religion and Public Life found, “Almost half of Catholics who are now unaffiliated (48%) left Catholicism before reaching age 18” (...some of them return to the faith later in life). Recently, thanks to the Secretariat of Clergy, Consecrated Life and Vocations of the United States Conference of Catholic Bishops (USCCB) we got the chance to interview teens about their religious faith in a national survey. 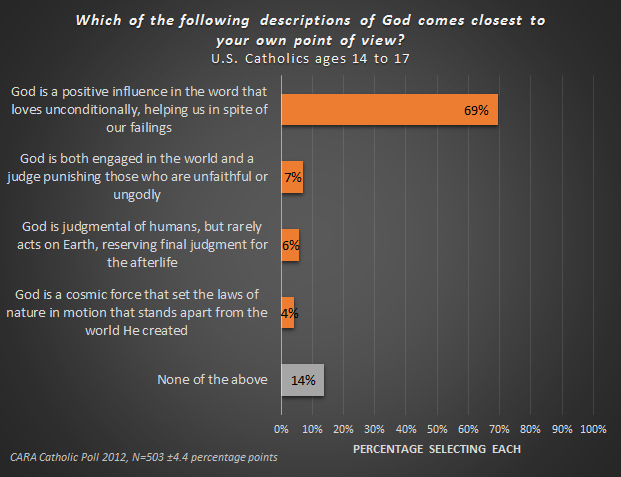 The overall study focused on interest in vocations. A total of 1,609 respondents were interviewed (English and Spanish) in May and June 2012. Of this sample, 677 respondents were ages 14 to 17. If you are a Catholic parent of a teenager the study indicates that the first thing you might want to ask your child is if they consider themselves to be Catholic. Although all of the teens we interviewed had Catholic parents or a Catholic parent, some did not share this faith (...parents were presented with information about the vocations study and asked to give permission for their teen to respond. Presumably all or most these parents are raising their children as Catholic). 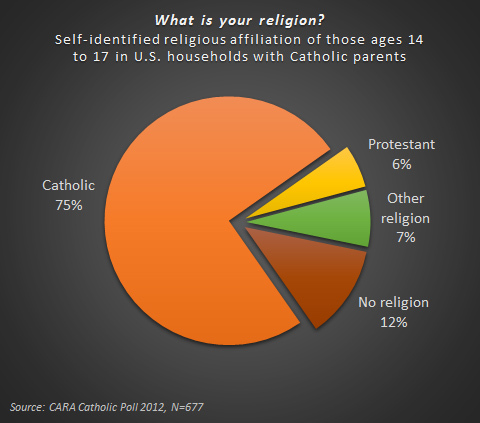 As the figure below shows, only three in four of all teens interviewed (75%) self-identified as Catholic. Twelve percent said they did not have a religious affiliation, 6% indicated that they were affiliated with a Protestant denomination, and 7% noted an affiliation with some other religion. Ninety-two percent of the teens with two Catholic parents self-identified their faith as Catholic (Overall, 76% percent of the teens indicated they reside in a household with two Catholic parents). Only 55% of those with one Catholic parent self-identified their faith as Catholic. Thus, some teens may be adopting the affiliation of a non-Catholic parent. It is also the case that as they become more peer-connected they may be attending services or religious programs with friends of other faiths and this may alter their religious identities. Some are “falling away” from religion generally and losing any affiliation. All of the results presented from this point on isolate only those respondents who are ages 14 to 17 and who self-identify their religion as Catholic. This includes a total of 503 respondents resulting in a margin of error of ±4.4 percentage points for this group. Most Catholic teens report that they were baptized as infants (94%). Five percent indicated they entered the Church as a child and 2% as a teen. 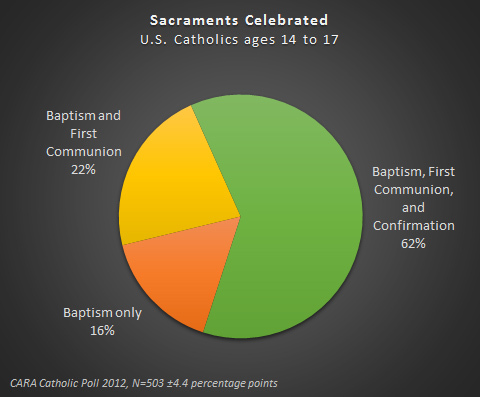 Sixteen percent indicated that they have only celebrated the Sacrament of Baptism. Twenty-two percent said that they have also celebrated their First Communion (Note: some of the younger teens may not be of an age where they could receive the Sacrament of Confirmation in their diocese). Many, 62%, reported that they have celebrated Baptism, First Communion, and Confirmation. Female teens are more likely than male teens to indicate they have celebrated their First Communion or Confirmation. 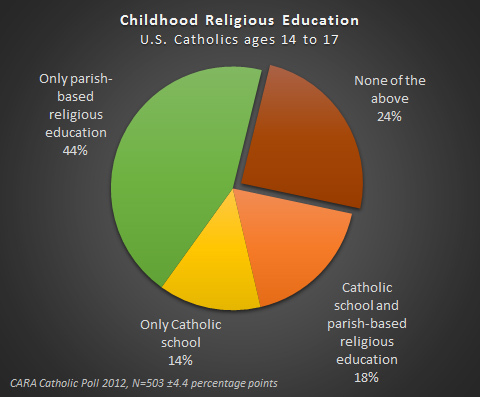 Eighteen percent report that they have been enrolled in a Catholic school and parish-based religious education classes at some point. The largest group, 44% said they have been enrolled in parish-based religious education only. Fourteen percent indicated enrollment in a Catholic school without having ever been enrolled in a parish-based religious education program. Thus, about one in four Catholic teens (24%) said they have never been enrolled in a Catholic school or a parish-based religious education program. 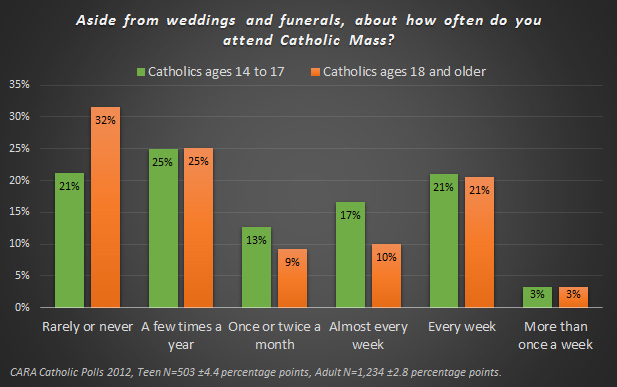 Catholic teens are a bit less likely than all adult Catholics to say they “rarely or never” attend Mass (The figure below compares teens to data from CARA’s most recent CARA Catholic Poll conducted in September 2012). This is not surprising as many Catholic teens are living with Catholic parents in their 40s and their Mass attendance mirrors their frequency (i.e., they often go to Mass with their parents). CARA research indicates many young Catholics begin to attend Mass less frequently once they leave the parental home and this often continues into their 20s before beginning to rise again in their 30s and 40s. 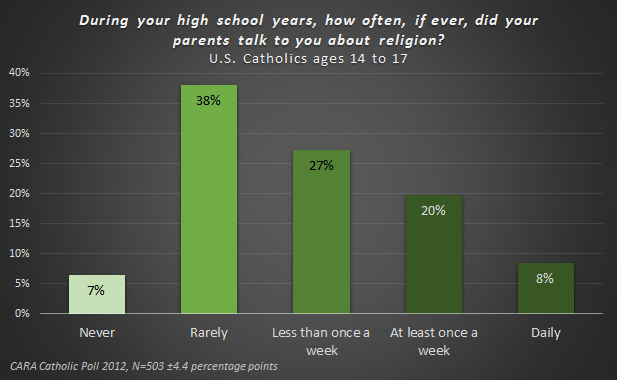 Although many parents may express concerns about their teens not communicating enough with them in general, many Catholic teens say their parents rarely or never speak to them about religion. Only 8% report their parents talk to them about religion daily and 20% say their parents do so at least once a week. The teens were also asked about the religious activities they take part in on a regular basis. Thirteen percent indicated regularly participating in retreats. Eight percent say they regularly participate in prayer groups, 7% in Eucharistic adoration, and 7% in Bible study. A quarter (25%) said they had participated in a parish youth group at some point. Fifteen percent said they had been an altar server and this percentage is the same for both males and females. Only 20% indicated that they read the Bible or pray with scripture at least once a month. Six in ten say they “rarely or never” do this. Fourteen percent indicate they pray the rosary at least monthly. At the same time, 71% say prayer is either “among the most important parts” of their lives (25%) or that it is “important, but so are many other areas of my life” (46%). 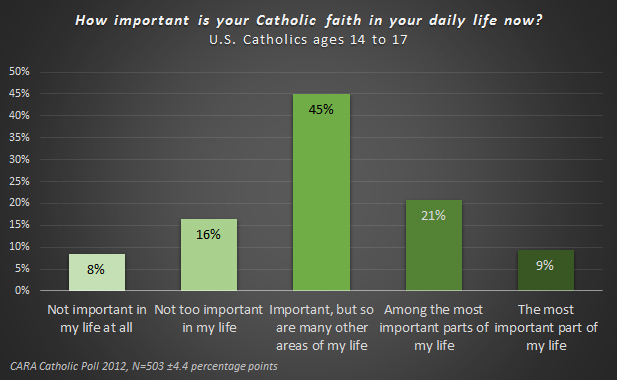 The teens were asked about how important a list of factors were to their sense of “what is means to be a Catholic.” They were most likely to say receiving the Eucharist (44%) and helping the poor (43%) were “very important” to their sense of this. These aspects were followed by protecting life (35%), attending Sunday Mass each week (32%), and having devotion to Mary (28%). Many of the aspects that are considered “very important” are things the teens can do outside of their parishes. 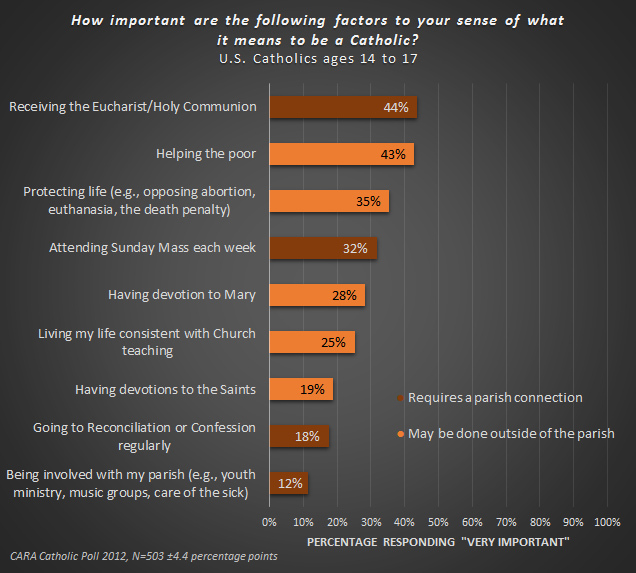 In fact, only 12% said “being involved with my parish” was “very important” to their sense of what it means to be a Catholic. 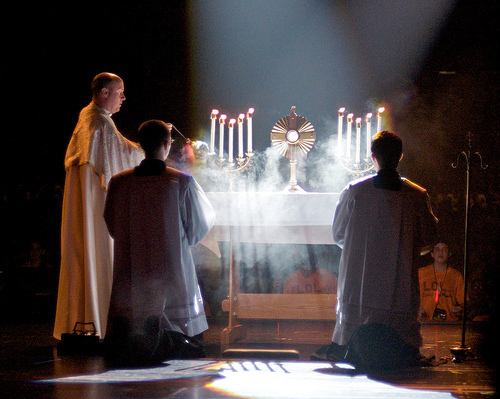 Overall, 61% percent of teens agree that “Jesus Christ is really present in the bread and wine of the Eucharist.” The other 39% agreed more with the statement, “Bread and wine are symbols of Jesus, but Jesus is not really present.” Among those stating a belief in the Real Presence, 61% said “receiving the Eucharist” is “very important” to their sense of what it means to be Catholic. By comparisons, only 17% of those who do not believe in the Real Presence consider receiving Holy Communion to be “very important” to their sense of what it means to be Catholic. Although use of new media and the internet is widespread and frequent among American youth, many Catholic teens do not indicate use of these tools yet to connect with content about their faith. 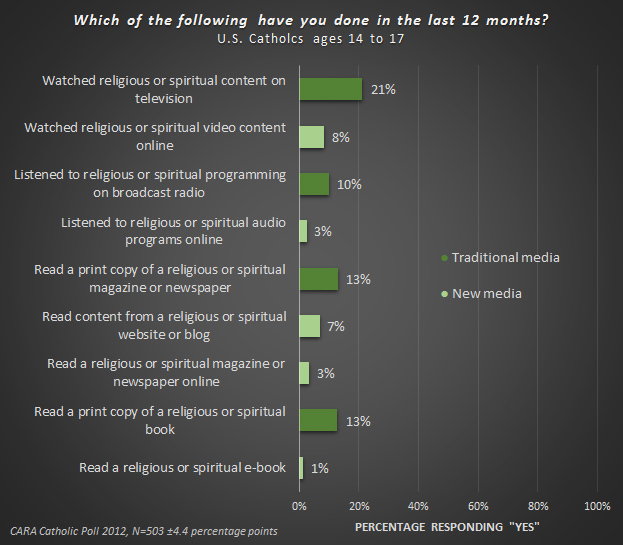 When these teens seek out religious or spiritual content they are still more often looking to traditional media than new media. Television is the most popular choice for this. In terms of demographics, 49% of the Catholic teens self-identified their race and/or ethnicity as non-Hispanic white and 38% as Hispanic or Latino. Seven percent self-identified their race and/or ethnicity as Asian or Pacific Islander, 3% as Black or African American, and 2% as Native American. Eighteen percent indicated that they were born outside of the United States. Applying survey percentages to Census population data, CARA estimates that there are about 4 million Catholics between the ages of 14 and 17 in the United States today. Thus, in the survey results above each single percentage point of the Catholic teen sample represents about 40,000 individuals. Interviewed in 2012, these teens were born between 1995 and 1998.